Walking is a good form of low-intensity cardio exercise, but it can put wear and tear on your joints. The knees, in particular, can end up sore or injured after excessive walking or running, hence why there’s a condition known as runner’s knee. Whether you’re already dealing with knee pain or you’d just like to prevent it in the future, you may be wondering if you’re better off going for walks outside or on the treadmill. Here’s what you need to know about each option and which will be easier on your knees. Although your knees absorb shock every time you walk, the amount of shock varies dramatically depending on the texture of the surface that you’re walking on. The most damaging surfaces for your knees are undoubtedly the hard surfaces, such as concrete and asphalt. Since these have no give to them, your legs absorb the full impact of each stride. This doesn’t mean that you’re guaranteed sore knees if you walk on concrete and other hard surfaces often. After all, there are people who run for miles every day on concrete. It’s just more likely that you’ll have knee issue the more time you spend walking on these surfaces. Although the tread on a treadmill is fairly solid, since it’s made of rubber, there’s a bit of give to it. It will be easier on your knees than those aforementioned hard surfaces. 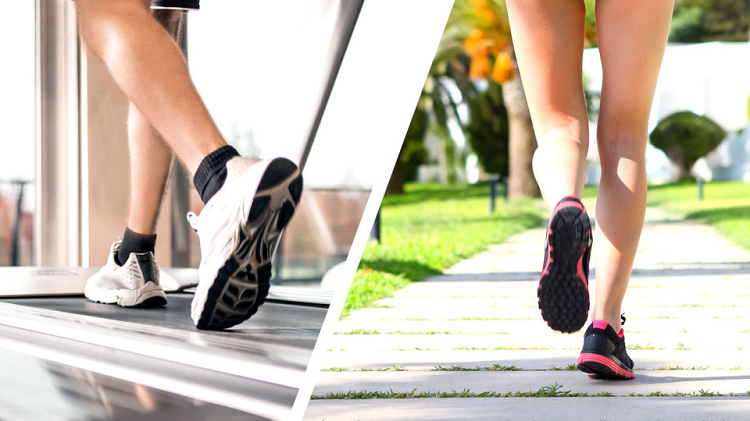 There are plenty of surfaces outdoors that put less strain on your knees than a treadmill because they’re a bit softer. These include grass, dirt and wood chips. They all give your feet a softer place to land and absorb some of the energy from each step, making them the most knee-friendly surfaces to walk on. However, there is a point where a surface can be too soft. With these surfaces, the softness makes walking on them difficult, and it puts just as much strain on your knees as a hard surface. Sand is one of the best examples of a surface that’s too soft and can damage your knees as a result. Surface texture is important, but it’s not the only factor to consider when it comes to your knees. It also puts a significant amount of stress on your knees to walk either on an incline or a decline. If you have a knee injury, it’s especially important that you avoid these situations so that you don’t aggravate it. With a treadmill, you don’t need to worry about this. You can set it to whatever incline or decline level you want, and it will be flat by default. When you’re walking outside, you could end up in areas with hills that will leave you with sore knees after. Another thing to remember when you’re walking outside is that you could end up walking on a variety of different surfaces. You may end up going from a grass or dirt path to a concrete sidewalk. Going from one surface to another is an adjustment, and that switch could strain your knees more. If you know where you’re walking, you can stick to one surface and avoid any inclines or declines. But treadmills do have an advantage in their consistency – you know the surface you’re walking on, your legs don’t need to adjust to any changes and you can keep it flat the entire time you walk. Don’t forget about the handrails that treadmills offer, either. These make it easier to stay balanced and stable, taking some of the work off your knees, although this also means that you burn fewer calories. Still, if you’re rehabbing a knee injury, those handrails can be useful. 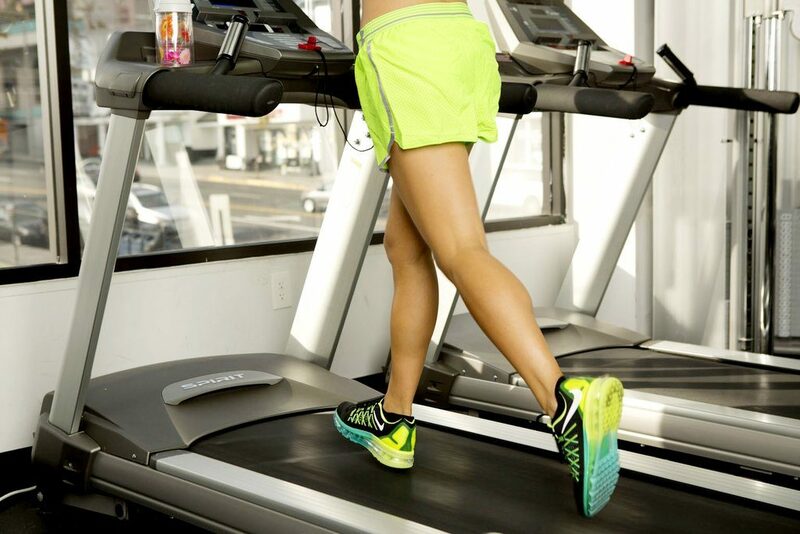 When it comes to walking outside or walking on a treadmill, the treadmill will usually be the better choice for your knees. 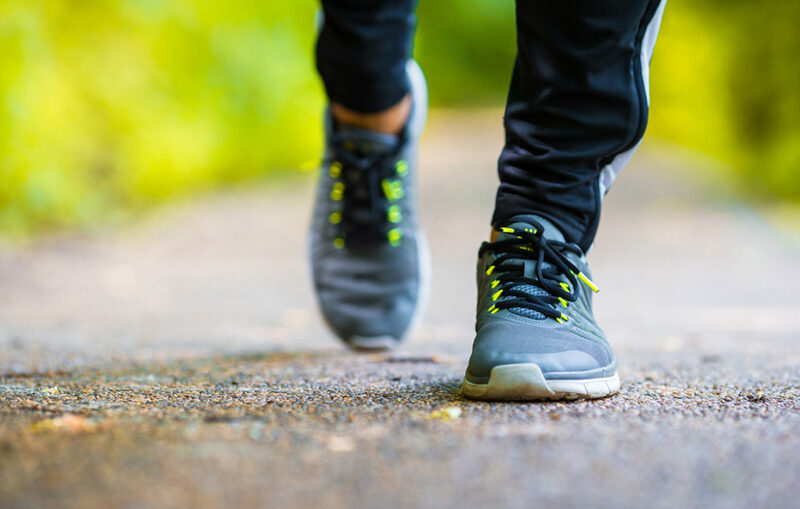 Walking outside can cause less strain on your knees if you’re walking on the right surface and it stays flat the entire time, but in most areas, you can’t guarantee that. The treadmill eliminates those variables.